Using Amazon Virtual Private Cloud (Amazon VPC) we can provision a private, isolated section of the Amazon Web Services (AWS) Cloud where we can launch AWS resources in a virtual network that we define. We have seen enterprises mostly prefer VPC model of deployment in Amazon cloud. Inside Amazon VPC, we can define a virtual network topology that closely resembles a traditional network with complete control over our virtual networking environment, including selection of IP address range, creation of subnets, and configuration of route tables and network gateways. 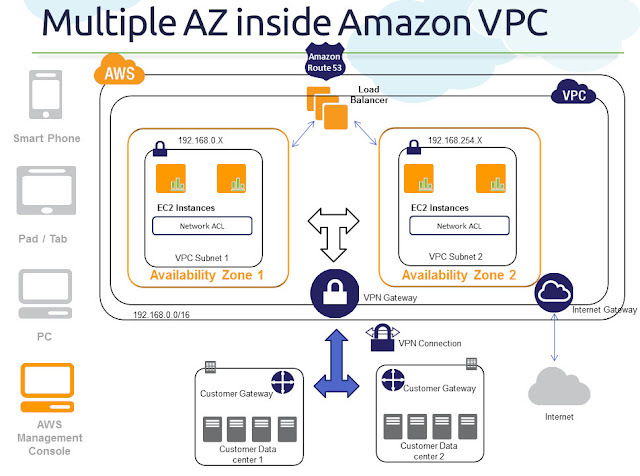 Since Availability zone concept works inside VPC, for deploying highly available applications inside VPC it is recommended to run it in multiple Availability Zones. Create multiple subnets inside a VPC and put each subnet in a distinct Availability Zone for High Availability. 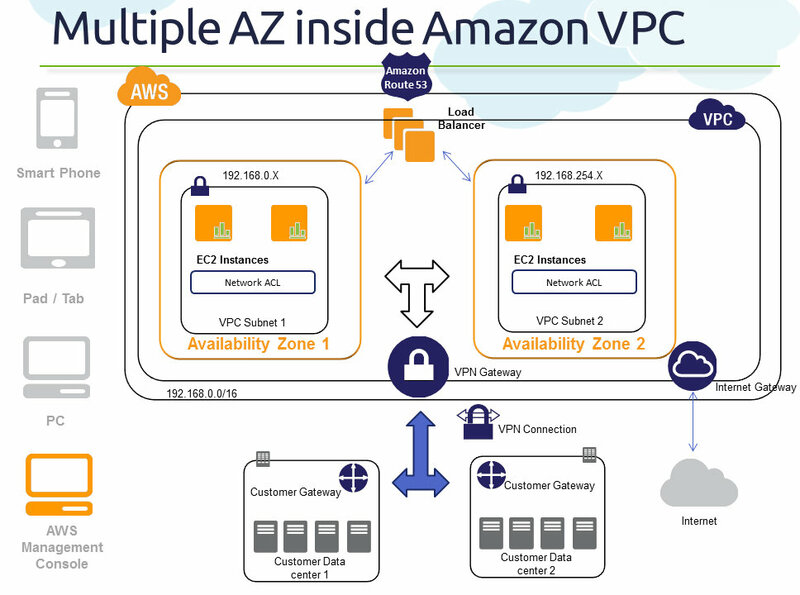 Currently a single VPC can span multiple Availability Zones and Multiple VPN connections, but we cannot create subnets inside Amazon VPC that spans multiple availability zones. Amazon VPC is available in all the regions of AWS infrastructure. Point 1) Amazon VPC is created in US-East Region of AWS. Point 2) Multiple subnets are created inside a VPC and each subnet is put in a distinct Amazon Availability Zone for High Availability. Example: Have your Web, App and DB layer distributed in public/private subnets inside availability zone 1a and keep a similar set in availability zone 1b as well for HA. Since we cannot create subnets inside Amazon VPC that spans multiple availability zones, we need to achieve HA using the above mentioned subnet-AZ network architecture. Point 3) Multiple VPN connections from the single VPC are attached to multiple customer gateways located in multiple geographies (simulating "branch office" architecture). Part 3: (AZ Series) How AWS Building blocks inherently leverage Availability Zones? Part 2: (AZ Series) Why we should leverage AWS Availability Zones? Part 1: (AZ Series) What is AWS Availability Zone ?